After a long time a talent from West Indies has arrived who looks a great future prospect, little known Barbadian Kirk Edwards showed lots of promise during his debut Test hundred against India. The one thing which I liked most about him is his self-belief. He looks very calm & composure and has a very good temperament. He does not believes in showing off, even after his debut Test hundred he didn't over-react. Here is a guy who can revive West Indies cricket if given proper opportunity and backed by the selectors. 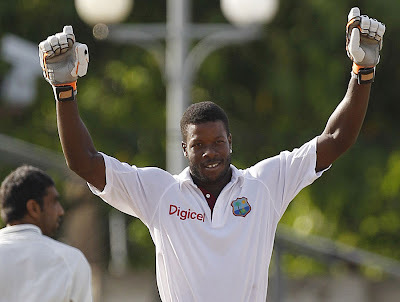 Filling in big shoes is never easy but Kirk Edwards who was replacing Ramnaresh Sarwan did the job wonderfully well and became the 13th West Indian cricketer to score a century on Test debut. Not only on the pitch but he looked confident in his post match conference too, the way he talked is quite remarkable, maybe he is new in International cricket but already very mature. The thing which makes him different from his other teammates is his attitude and views towards cricket, he speaks his mind which is very rare in West Indian cricket these days. Look at his this post match statement: “There is so much negativity in the Caribbean. When I go to the super-market people shout at me ‘You cannot win matches.' I want to change the can't into can.” It speaks a lot about him and what he wants to achieve. Kirk Edwards comes from a cricketing family and also holds a level 1 coaching certificate, may be this is the reason behind his maturity and understanding towards the game. He has a habit of scoring runs from beginning. He was considered as best overseas batsman when he played for England’s Twickenham Cricket Club in 2005. Kirk has also coached & played for Ireland’s Phoenix Cricket Club. Don’t know about others but I am very impressed by this guy, looks a very good captaincy material. He has the ability of taking West Indian cricket to a new high, to its old days. Here is wishing him all the success and a great career ahead. Hope someday he gets the opportunity to captain this West Indian side.